In September 1852 the parish of St Mary in North Marston, Buckinghamshire, a benefice of the Dean and Canons of Windsor, made the news. The parish had a longstanding claim to fame – it had been the burial place of Master John Schorn before his remains were removed to St George’s Chapel in 1478. Schorn was rector at North Marston at the end of the thirteenth century and a locally celebrated holy man. After he died miracles were observed at his tomb and pilgrims regularly visited the site. What captured the attention of journalists in the autumn of 1852 was the death of the Lay Rector of North Marston, John Camden Neild, who had leased an estate there from the Dean and Canons of Windsor. Neild was not known for his generosity during his lifetime. A survey of 1825 declared the Vicarage and outbuildings at North Marston to be in a dilapidated state, but Neild strongly protested against the investment of further money into their maintenance [SGC M.1137/3]. In the same year he allowed the rent to fall into arrears. Correspondence with the Chapter Clerk from 1825 indicates that his status and rights as lessee of North Marston were being reconsidered. Upon Neild’s death, the papers made much of his reputation for isolation and miserliness. One was relatively forgiving: ‘Although of most penurious habits, and always insisting upon the enforcement of what was legally his due, Mr Neild was never known to degrade himself beneath the character of a gentleman’; another had no qualms in describing him as a ‘miser son’ [SGC M.1137/1]. However, Neild had great personal wealth. He had been Barrister-at-Law at Lincoln’s Inn and a magistrate of the County of Middlesex, and held estates in Buckinghamshire and Kent, as well as his principal residence in Chelsea. His fortune had been bequeathed to him by his silversmith father; he was the sole heir. Upon his death he left that fortune to Queen Victoria, and although estimates of its real value differed wildly, it was large enough to have attracted much attention (it is now believed to have been approximately £500,000). At a time when ‘so many thrones were overturned and dynasties shaken, [this was] a singular illustration of loyalty’ [SGC M.1137/1]. 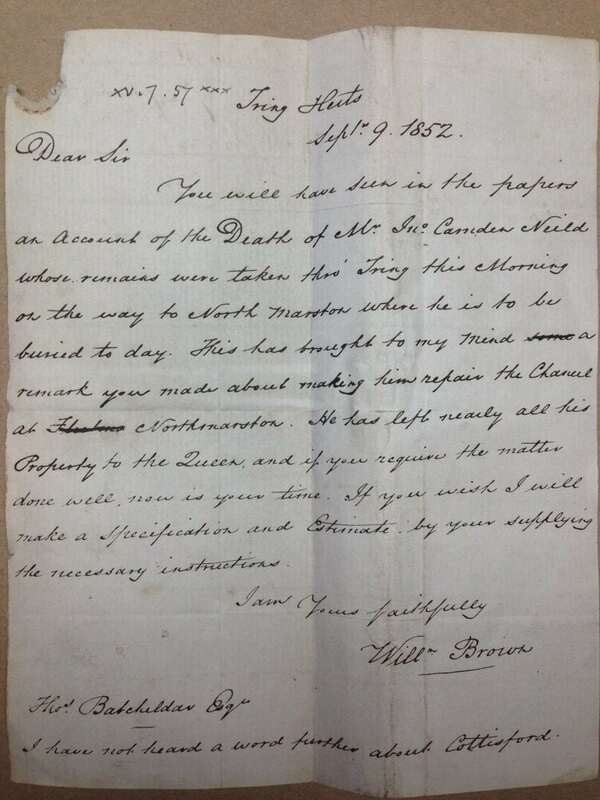 Correspondence of the Chapter Clerk, now held in St George’s Chapel Archives, shows that the Queen reinvested this ‘miser’s fortune’ in the parish of North Marston. A specification was drawn up for repairs to be carried out to St Mary’s church [SGC M. 1137/4/2], and Sir Digby Wyatt was commissioned to restore the chancel and east window of the church [SGC M.1137/1]. A donation was made to reopen the National School in the parish [SGC M. 1137/4/12-15]. It seems, however, that Neild’s bequest had an impact far beyond North Marston, allegedly funding the weddings of Queen Victoria’s children and the restoration and improvement of Balmoral Castle [SGC M.1137/1]. The Queen commissioned a royal memorial to John Camden Neild and his unexpected generosity at the church. The documents held in St George’s Chapel Archives reveal that Neild’s actions left a lasting legacy both for the royal family and the community at North Marston.